Yes, yes, I know… for some of you “design” may be even more frightening than our previous posts, but it shouldn’t be. And to clarify upfront, by design, I’m going to strictly focus on book cover designs in the world of middle-grade fiction. So, why that specific focus? Because I work in a publishing company as the Creative Director and I design or help to design books for middle-grade nonfiction reads all the time. I’d like to improve my skill by looking at and studying others who have done great work. That and my good friend, Curt Sisco, and I have written a middle-grade fiction book. And by golly, it would be great to have a well-designed cover on it someday. 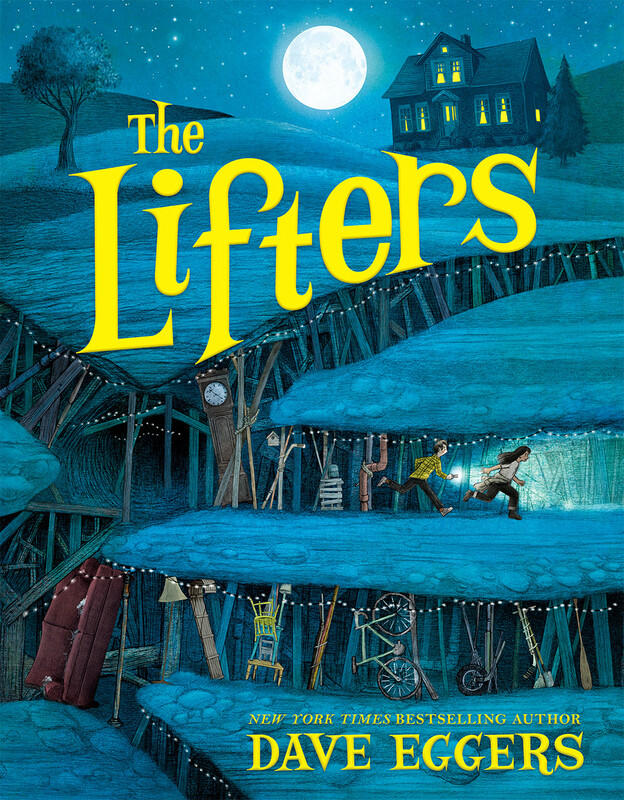 So today, I start with the design of “The Lifters” by Dave Eggers. Sadly, since this book has not been released at the time of writing this, I can not find and attribute the illustrator nor the graphic designer of the cover. My humble apologies, dear and talented folks! I’ll try to keep this brief, since most of you don’t want to geek over the minutia of CMYK, kearning vs tracking and what not. Using such a limited palette of color makes this design really pop. So often, I find too many colors in a design only leads to confusion and a disunity to it. A rainbow of colors often begins to look like a bowlful of jellybeans where the focus gets lost in the jumble of it all. Now, saying that this design offers a limited palette, you can notice that it’s not limited to two colors. There are all sorts of tints and shades going on within the blues and yellows, but there is the dark red in the couch, and a warmth coming from the rusty pipe and grandfather clock. Just enough to add highlights of color but not enough to detract, IMHO. Often times the little details that go into a design can be overlooked. But these little alterations are often the hidden gems in the design process. The bottom of the letters F and R nicely are slanted to match the angle of the tunnel they rest on (along with the top of the H and R–take note). A couch is used to prop up the tunnel walls, along with a score of hockey sticks and other fun details. Do they actually show up in the text of the book? Dunno, but it would play for a nice touch if they were referenced in the story itself. The Lifters book has a very pleasing layout between the text and the illustration. There’s a real art to wed the two together. The top of the design nicely pulls you in (how about that brilliant moon!). A clear simple title gives you the quickest sense of the book and then the illustration takes over and leads you down, down, further in. 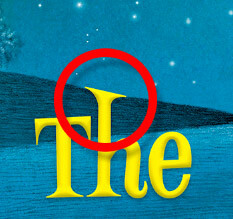 Knopf Books for Young Readers really makes this color look quick and easy (though, trust me it wasn’t!) Well done! Just a few of my initial thoughts on a middle-grade book coming out on April 24, 2018. Looks like it will be a great book if you are like me and you DO judge a book by its cover!